Only in Nyack can you find a Farmers’ Market so dedicated to the principle that art and culture are part of a balanced diet. In honor of those who believed in me, I want to spend this Thanksgiving column giving thanks to the groups in our community who help others: Soup Angels, Nyack Center, United Hospice of Rockland and Meals on Wheels. I have included contact information if you wish to make a year end donation to support the work of these institutions that make our village home so sweet. For the hungry, the First Reformed Church tower on South Broadway is a beacon of hope. Inside this building that almost scrapes the sky, an organization called the Soup Angels provides food and comfort to the needy three nights each week. This Wednesday, for the 12th year, Soup Angels will serve over three thousand Thanksgiving meals throughout the county. Soup Angels will provide a turkey dinner with all the trimmings for anyone in the Nyack area who would like a Thanksgiving meal in a welcoming, festive atmosphere (no questions asked) on Wed, Nov 21 from 4 to 7p in the First Reformed Church. The entrance is on Burd St between Cedar and S Broadway. It is accessible to the disabled. 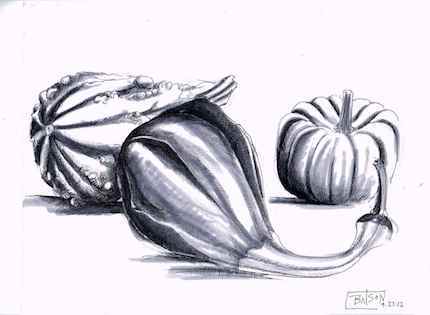 Read more about the annual Soup Angels Thanksgiving feast in Bill Batson’s Nyack Nyack Sketch Log: Soup Angels Serve Three Thousand for Thanksgiving. The only thing not central about the Nyack Center is their location. At the corner of Depew Avenue and South Broadway, their address is too southeast to claim the geographic middle of the village. But in all the measurements that matter, Nyack Center sets the civic standard. It is a place where children find safety, support and a space to study and adults gather to experience art and culture and discuss public policy. The premises, with a distinguished historic pedigree, shelters small businesses creating an indoor market place. Nyack Sketch Log: Support Nyack’s Center. The staff that work from this serenely situated suite of offices tucked away on a quiet cul-de-sac in New City have given great comfort to thousands. United Hospice of Rockland, Inc. (UHR) provides a wide range of services to individuals facing serious illness and their families. When my family was confronted with the challenge of making end-of-life decisions for two beloved family members, all of our most urgent personal and professional needs were met by United Hospice of Rockland. Meals on Wheels delivers. For people who cannot shop or cook because of illness, physical disability or advanced age, their service fleet is a lifeline. For those who can travel, but need a destination for social and recreational activity, MOW operates five senior center in Rockland County. Granting independence for individuals and support for fragile families, MOW provides more than just the safety net, but the tent and a team of acrobats who bend over backwards to care for seniors. I should know. My mother attends their daily program at 90 Depew Avenue in Nyack. 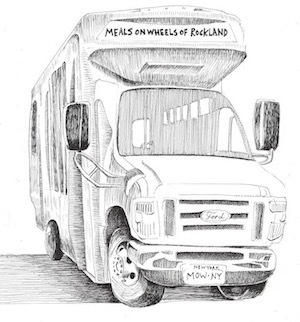 Meals on Wheels Programs & Services of Rockland, Inc.
Nyack Sketch Log, Volume 2 will be available on Tuesday, November 27. 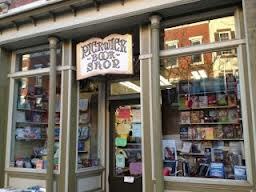 Join me for the book launch at 6p at the Hudson House, 134 Main Street. Soup Angels is one of the fifty-five sketches and short essays in this new volume. 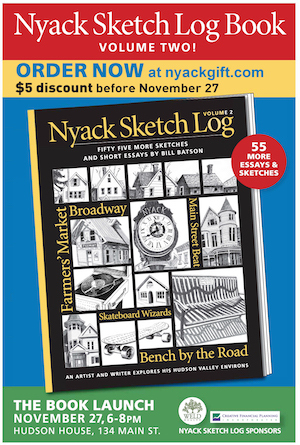 Purchase an advance copy and get $5 off the cover price at nyackgift.com or stop by the Bill Batson Arts tent at the Nyack Farmers’ Market which is open Wednesday of this week, to accommodate Thanksgiving on Thursday.